Are you looking for a humidifier which can not only function well to fill your room with enough moisture but also better suit your home’s décor? Why not get a VicTsing 3L Ultrasonic Cool Mist Humidifier now? 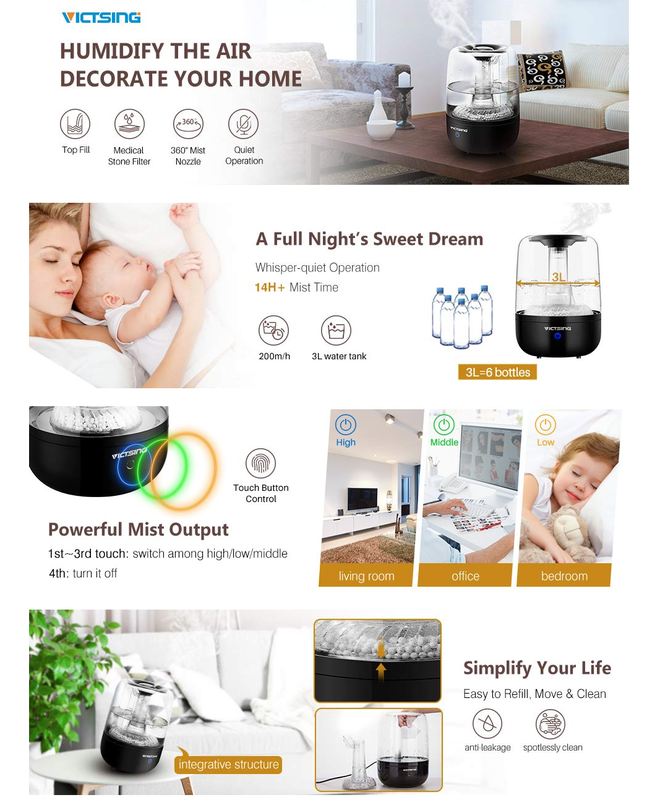 VicTsing, dedicated to make more professional and delicate Cool Mist Humidifiers, is far ahead of the market and aims to bring you a healthier and more beautiful life. This time VicTsing has broken the market tradition and created a transparent plus black humidifier with one-piece structure, better suiting the décor of your home. VicTsing 3L large capacity ensures a full night’s humidifying with maximum mist volume up to 200ml/h, making your room full of comfy humid air to prevent dry skin, rhinitis, ease eye dryness and alleviate insomnia, etc. 【FILTERING CAPABILITY】Comes with medical stone filter, this Ultrasonic Humidifier can filter impurities and bacteria, which offer you healthy air efficiently for whole house, keep you away from illness result from air quality. 【EASY TO REFILL AND CLEAN】Unlike those traditional humidifier, it’s hard to refill and clean from the bottom. With VicTsing’s top fill design, you even don’t need to open the lid to add water, you can refill when it’s working. Successfully avoid the leaking situation. The tank mouth is big enough to reach into it to clean. 【3 MIST MODES &Whisper Quiet】 The 360°mist nozzle meets your need of different humidifying directions. Low/Medium/High Mist are available to set easily according to your preference. Lower noise of 35dB(quieter than turning page, barely audible), suitable for sleeping working & studying, in your bedroom, office, baby room. 【SAFE TO USE】 3 L water tank can run for 14 hour with powerful mist. Max mist output 200ml/h. The air humidifier will auto off with orange indicator light flashing for about 10s, don’t worry about safety issue at night. 【QUALITY GUARANTEE】 Having passed the Internationally Recognized EMC Test to guarantee your safety. Every VicTsing product has 45 days money-back and 12-month worry-free Guarantee! 1. Please DO NOT add any essential oils into the machine. 2. Please do not add water over the MAX line. 3. Please clean the humidifier regularly. 4. Please do not use this product on blankets. 5. Please keep the product away from wall at a distance about 15cm when in use. 6. US Standard Plug is included in the package, which is only suitable for the US, Canada and Mexico.